Republica A team led by Maha Jodi - Madan Krishna Shrestha and Hari Bansha Acharya - pose for a photo in the capital on Monday before embarking on a tour of 10 cities across the nation to perform in the Royal Treasure - Maha Yatra 2073 from February 24 to March 8. KATHMANDU, Feb 20: Renowned comedian duo Madan Krishna Shrestha and Hari Bansha Acharya popularly known as Maha Jodi along with a team are all set to entertain Nepali audience across the nation. 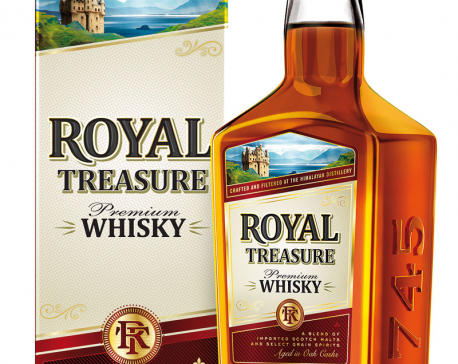 The event entitled “Royal Treasure - Maha Yatra 2073”, to be held in association with Jawalakhel Group's Himalayan Distillery Ltd is taking place in 10 cities from February 24 through March 8. The team of artists consists of Madan Krishna Shrestha, Hari Bansha Acharya, Narendra Kansakar, Kiran KC, Shiva Hari Poudyal, Mohit Acharya, Yoman Shrestha, Raja Ram Poudel, Mandabi Tripathi and Rubina Adhikary. It is a three-hour show. The event is scheduled to take place in Pokhara on February 24, Bhairahawa on February 25 and Dhangadhi on February 27. Similarly, the event will take place in Mahendranagar, Nepalgunj, Butwal, Shauraha, Biratnagar, Birtamod and Dharan on February 28, March 1 through March 7 respectively, reads a statement issued by the organizer. “The tour is presented by Royal Treasure in association with Hotel Association of Nepal. This is a fund-raising event for the regional chapters of Hotel Association of Nepal. The fund raised from the event will be used to uplift the service sector of people working in the regional hospitality industry, provide training, provide scholarships etc,” reads the statement.